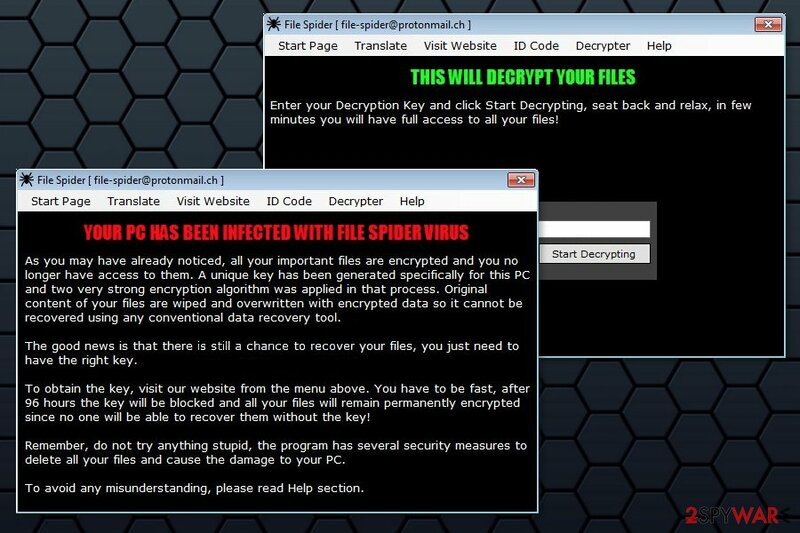 File Spider ransomware uses sophisticated techniques to infiltrate computers and hide from its victims. Use Reimage to determine whether your system is infected and prevent the loss of your files. File Spider ransomware is a malicious program which aims to encrypt valuable information on the victimized computers to earn illegal profits. After it reaches the system and encodes data, it demands to pay the ransom within 96 hours to receive a decryptor. According to the latest news, the ransomware targets people from the Balkans — Bosnia, Serbia, Croatia, etc. However, security experts do not recommend following such orders. Criminals are not worth relying on because you might lose your money as well. 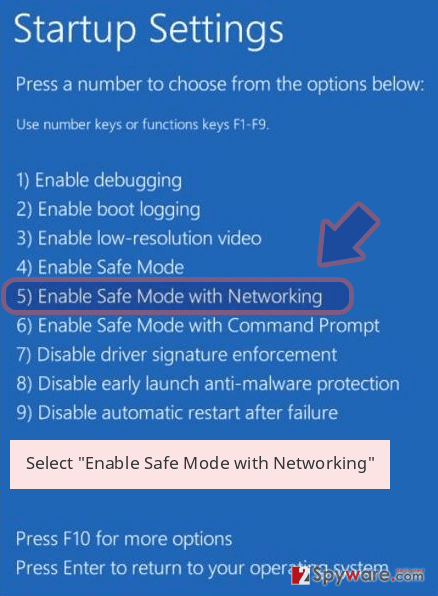 Thus, after you have noticed .spider extension at the end of your filenames, you should focus on File Spider removal because it may have modified the system, opened a backdoor to other cyber threats and made your PC vulnerable. File Spider ransomware is usually dropped on the system from the malicious MS Word document and executed using PowerShell. The virus on the system operates from two components. 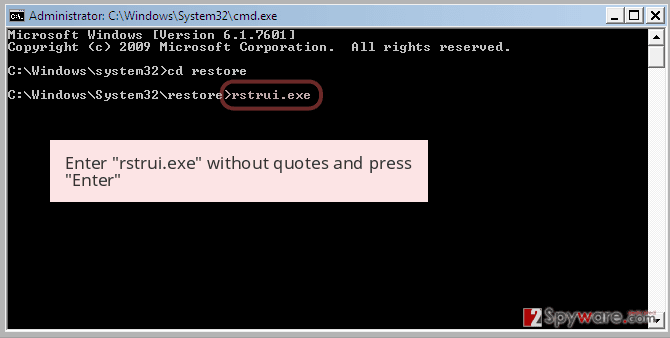 The one is an encryptor that arrives on the system as an enc.exe file. The second element is a decrypter and the main GUI that runs from dec.exe. Following data encryption, ransomware shows a ransom demanding window called “File Spider [ file-spider@protonmail.ch].” It includes a detailed explanation about data encryption and gives instructions what users have to do. The ransom note also provides a link to the video hosting site where the victims can find a video tutorial on how to decrypt the data. In the Start Page, victims are threatened not to take any other action because File Spider malware is said to be capable of detecting them and deleting encrypted files as a punishment. However, it’s currently unknown if ransomware actually has this functionality. Though, elimination of the malware is still needed. Nevertheless, cyber criminals try to be helpful and give even video tutorial how to access payment website; you should not follow their orders to avoid money loss. Ransomware is used for swindling the money illegally. Thus, once they receive the payment; they might disappear and do not give the decryption key. 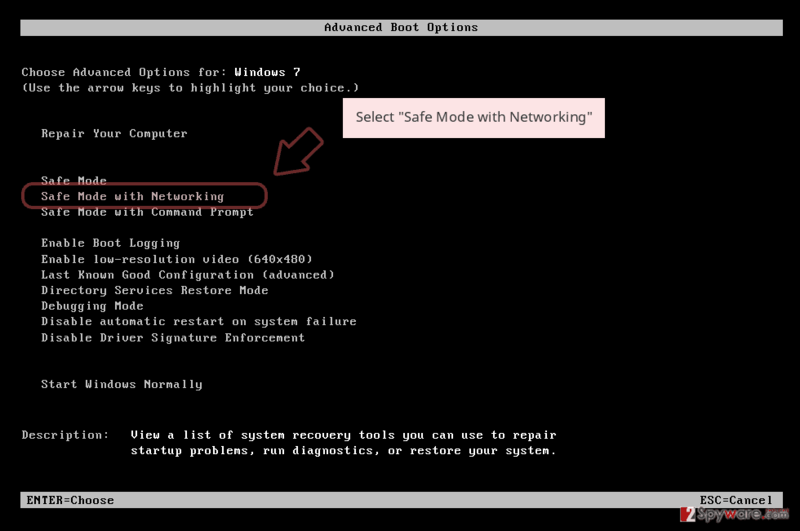 If you see this threatening window on your computer’s screen, you should reboot to Safe Mode with Networking and remove File Spider virus using reputable malware removal software, such as Reimage. File Spider ransomware gives 96 hours to obtain a decryption software. While crypto-malware can spread with the help of different techniques, this one particularly reaches the victim as a fraudulent email letter with the subject line Potrazivanje dugovanja, which means Debt Collection in English. The malicious letter holds Word document written in Bosnian language. To decode the malicious files, PowerShell script uses AlbertTI key in the XOR operation and saves the payloads inside the executables of the ransomware — enc.exe and dec.exe. Therefore, malware researchers team from Bedynet.ru warn that users have to be careful with downloads, updates, and ads because they might also be used for spreading the virus. Thus, you should not click or download any suspicious content online. It is important to understand the risks of File Spider ransomware. 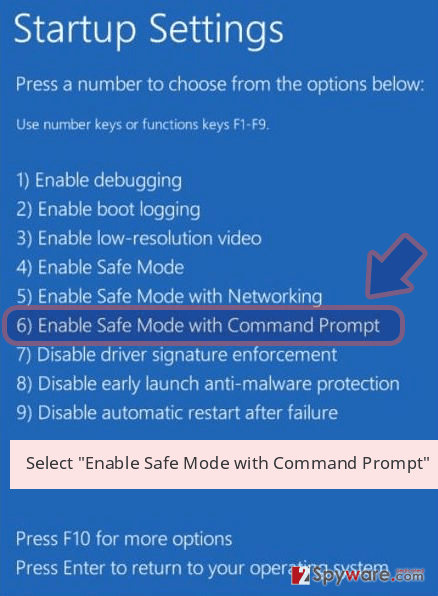 It can not only corrupt your files, but also let inside other dangerous computer threats to damage your system. Therefore, its elimination procedure should be held with an extreme care. Sadly, but the regular computer user is not experienced enough to deal with ransomware-type cyber infections. Likewise, the only option to clean your system is to ensure File Spider removal to a professional security software. Our top recommendations would be Reimage, Malwarebytes MalwarebytesCombo Cleaner and Plumbytes Anti-MalwareMalwarebytes Malwarebytes. They are particularly designed to be easy to use and finish the elimination procedure quickly. 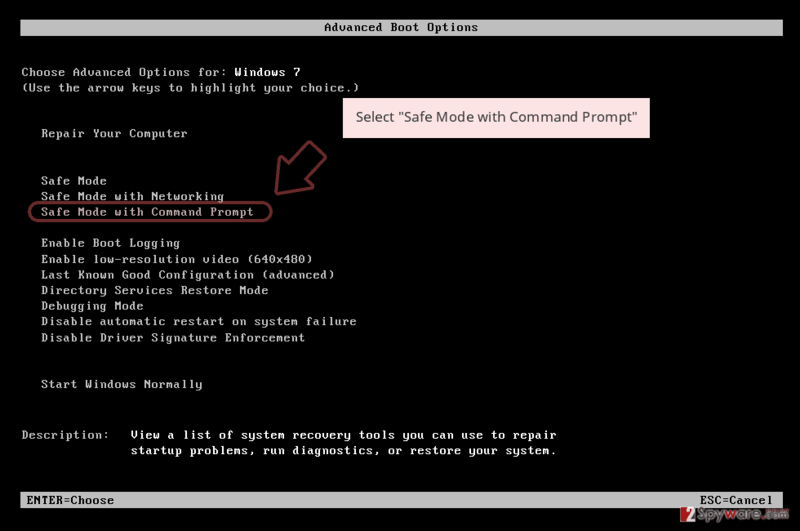 If you want to perform automatic termination, you might need to reboot your PC into Safe Mode to prevent the ransomware blocking your system. Those who are not aware of how to do that can follow the instructions provided below. Once you remove File Spider from the computer, you can restore encrypted files from backups. However, if you do not have them, you can try alternative recovery tools. You can find our recommendations below as well. Log in to your infected account and start the browser. Download Reimage or other legitimate anti-spyware program. Update it before a full system scan and remove malicious files that belong to your ransomware and complete File Spider removal. 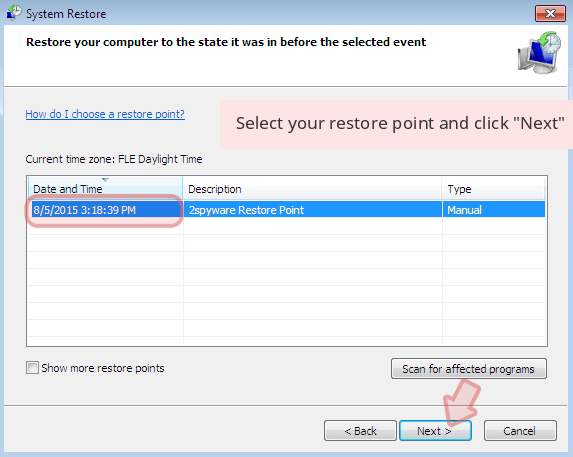 When a new window shows up, click Next and select your restore point that is prior the infiltration of File Spider. After doing that, click Next. Once you restore your system to a previous date, download and scan your computer with Reimage and make sure that File Spider removal is performed successfully. Guide which is presented above is supposed to help you remove File Spider from your computer. To recover your encrypted files, we recommend using a detailed guide prepared by 2-spyware.com security experts. You can restore files with .spider extension with the help of this professional tool. Keep in mind that it is handy since you can also recover data if you have accidentally deleted it. 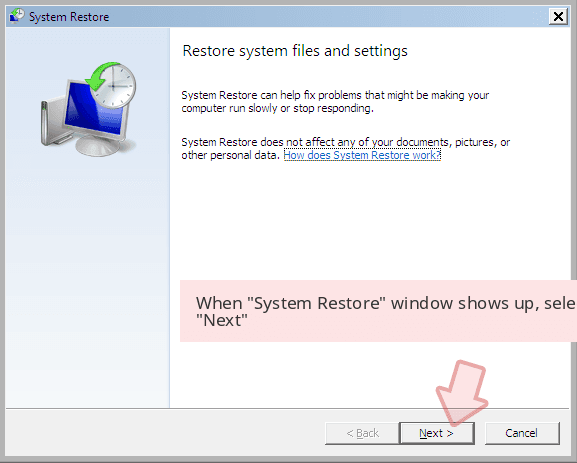 This option suits the ones who want to particularly recover individual data and if the System Restore function was enabled before ransomware infiltration. Note that Shadow Volume Copies are necessary to use this tool. ^ Ransomware. Techopedia. Defining the latest tech buzzwords. ^ Ryan Harnedy. What a $20,000 Ransomware Attack Can Teach You About Backup and Recovery. Barkly Endpoint Security Blog. Latest endpoint security news, tips, and actionable insights. ^ Bedynet. Bedynet. Cyber security news. This entry was posted on 2019-04-01 at 04:06 and is filed under Ransomware, Viruses. You can quickly scan the QR code with your mobile device and have File Spider ransomware manual removal instructions right in your pocket. How did you remove File Spider virus?